November 3, 2018 (Santee) – An elderly, disabled man was found dead in a Santee mobile home that burned overnight. The man called 911 to ask for help, telling the dispatcher he had difficulty moving around. 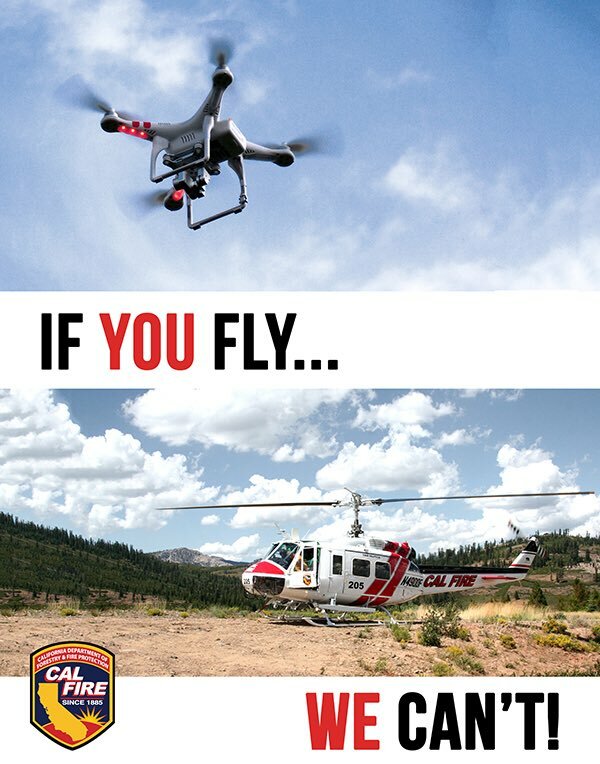 June 26, 2018 (Santee) -- Cal Fire reports that a drone forced grounding of a firefighting helicopter today in Santee while ground crews fought a fire that began late this afternoon on Prospect Ave. near Highway 52 and Cuyamaca. The blaze briefly caused evacuations, 10 News reports. The fire has now been contained, according to the Sheriff's Department. April 10, 2018 (Santee) – A fire has scorched multiple apartments at Santee Villas in the 10400 block of Mast Boulevard across the street from Santana High School tonight, where a passerby told East County Magazine details of efforts to save residents and pets from the flames. Update 10:15 a.m. - Forward spread of this fire has been stopped at 30 acres, CAl FIRE Captain Kendal Bortisser reports. The fire burned to Friars and 163, per ECM reporter Nadin Abbott. This fire has been under unified command of CAL FIRE, Santee Fire and Miramar Fire. May 17, 2014 (Santee) 9:15 a.m. – A brush fire is burning in the Sycamore Canyon/Santee area in rugged terrain accessible by hand crews and brush trucks; aerial resources have been dispatched. The fire is now two to three acres. Smoke is visible from State Route 125. If you are in this area and have eyewitness information please share in the comments section below. You can also send photos to editor@eastcountymagazine.org. April 29, 2014 (San Diego’s East County)-- The day started with smoke in the far East County, near Jacumba on Old Highway 80. Cal Fire responded only to find a structure fire on the other side of the border fence. Per the incident commander, the structure was fully involved and crews remained on scene to make sure it did not pose a threat. Since the house had good clearance, there was no threat to vegetation, or the United States. The second fire was in Ramona. It was a compost fire at Dye Street south of Ramona Street. It was extinguished in short order. The third and most serious was near the Carlton Hills Golf Course in Santee. A parking lot at Carlton Hills Southern Baptist Church became the Incident Command Post for the blaze, which briefly threatened apartments nearby. May 26, 2013 (San Diego East County)—Fire season is off to an early start. Yesterday, even as firefighters fought to contain the 1800-acre San Felipe fire in the mountains of East County, four new fires drew resources from across the region. Here is a wrap-up on those fires in Ramona, Lakeside, the Santee/San Diego boundary area, Dulzura, and the border region. January 6, 2013 (Santee)—Pixi Welsh, 2 ½ , is the daughter of Santee Firefighter James Welsh. She was diagnosed with leukemia in November and was admitted to Children’s Hospital. Blood donations are needed, since she faces over two years of therapy including chemotherapy and blood transfusions. Pixi’s illness has also placed a huge financial strain on the family, since her father will be out of work for months and medical bills are growing. July 12, 2011 (Santee)--The Santee Fire Department along with units from Lakeside and La Mesa responded to the report of a residential structure fire at 9117 Fonteyn Ct. in Santee this afternoon. The first fire unit arrived just over eightminutes after the time of dispatch; 19 firefighters quickly brought the blaze under control and restricted the damage to the garage area. Update 7 p.m. The fire is now out, after charring over 12 acres and briefly threatening homes. View our video shot by Billy Ortiz by clicking the image above. March 2, 2011 (Santee) – After an extensive nationwide search, Santee City Manager Keith Till has named Robert E. Leigh as the city’s new fire chief. Leigh is currently a deputy fire chief for the city of Aurora, Colorado, the state’s third largest city and a community of 314,000 east of Denver. Update 6:45 p.m. - The fire destroyed one home and damaged a neighboring residence before fire officials were able to douse the blaze. Authorities have not yet disclosed the fates of the homeowner and his wife, however the investigation has been turned over to the Homicide Unit. Neighbors have told other media that the homeowner was despondent because he and his wife had lost their jobs, faced foreclosure, and because the wife had cancer. December 2, 2010 (Santee)—Fire crews have extinguished a blaze that started with an explosion in a garage in the 9400 block of Domer Road in Santee around 11 p.m. last night. Fire spread to the home and deputies reportedly heard smaller explosion inside the residence. November 3, 2010 (Santee)-- Fire crews from Santee, Lakeside, and El Cajon were dispatched at 12 noon today to the vicinity of Hartley Rd and Stevens Rd in Santee. Upon arrival, active smoke and fire was seen at Advanced Electromagnetics Incorporated (AEMI) at 9311 Stevens Rd. Fire crews initiated a “fast attack” and the fire was quickly extinguished, but the smoldering contents turned out to be highly toxic materials. September 25, 2010 (Santee) -- A brush fire in Santee charred approximately 40 acres late this afternoon, briefly threatening structures before firefights brought the blaze under control. Multiple agencies responded to the fire, which began at Carlton Hills and Lake Canyon. Update 5:20 p.m. The fire is now out and was contained to less than an acre. Firefighters are mopping up hot spots, according to Santee Fire's Brett Eldridge. Cause is believed to be accidental, possibly from a bulldozer scraping rocks, he added. September 2, 2010 (Santee) 4:40 p.m. – A brush fire has broken out at the Sycamore Landfill in Santee at 8514 Mast Boulevard. “So far I’ve seen Santee, El Cajon, and La Mesa Fire roll down my street,” said Mark Schoonover, who shot the photo above. Update 7:30 p.m. -- Cause of the fire has been determined to be accidental, due to workers installing a fence. August 27, 2010 (El Cajon) updated 1:30 p.m. -- Heartland Fire dispatch confirms that a fire that forced evacuation of homes near Grossmont College is now fully contained. No buildings were lost or damaged. Scroll down for videos provided by a reader. August 21, 2010 12:50 p.m. (Santee) - A fire in the vicinity of Prospect in Santee briefly threatened homes, ECM learned from our fire spotter in the field. Firefighters brought the blaze under control within minutes and aerial support requests have been cancelled. August 17, 2010 (Santee) – A brush fire raced up a slope behind several homes on Strathmore Drive Saturday afternoon, just east of Santee Lakes. Cause of the fire is "suspicious," Santee Fire Division Chief Brett Eldridge told East County Magazine. Update 3:15 p.m. The fire has jumped to 259 acres, Viejas Fire Chief Don Butz has informed ECM. "It's in a very inaccessible area," said Butz, adding that the forward spread of the fire has been slowed. June 26, 2010 (Santee) - A vegetation fire that began late this morning north of Santee is now approximately 70 acres in size, according to Heartland Fire dispatch. The fire is burning westward into federal property in the adjacent Miramar area. The blaze is not yet contained, however the forward spread of the fire is slowing, Heartland informed East County Magazine. Currently there are 100 firefighting personnel, five hand crews and three helicopters battling the blaze. Fixed wing aircraft have been released. Update 5 p.m. The fire, which burned approximately five acres, has been halted. May 12, 2010 (Santee) - A brush fire is burning at Big Rock Park, where evacuations are underway. In addition, Incident Page Network reports that Chet Harritt school is slated for evacuation. Multiple units and air attacks are on scene, Cal Fire confirms. September 24, 2009 (Santee)--An early morning fire in Santee on Thursday required a response of engines and trucks from Santee, El Cajon, and Lakeside. The first engine arrived on the fire scene at 10530 Flora Veda, minutes after a call came into the Heartland communications center. July 12, 2009 (Santee) – A small brush fire that started around 4 p.m. this afternoon at 9255 Magnolia, near the Las Colinas Women’s facility in Santee, has been extinguished. The blaze burned less than three acres. No structures were damaged. Sheriff’s deputies alerted mobile home park residents in the vicinity of the fire, but no evacuations were ordered. One mobile home park resident was transported to a hospital during the fire, however a dispatcher said she could not confirm whether the individual was injured from the fire or had an unrelated medical issue.